William Otterwell Brady was born in Fall River, Massachusetts in 1899. He was ordained a priest in 1923 and after coming to the Archdiocese of Saint Paul in 1924, he was consecrated bishop of Sioux Falls, which he served from 1939-1956. 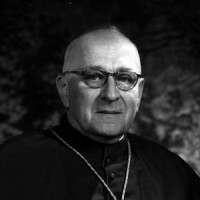 Upon being appointed coadjutor Archbishop of Saint Paul early in 1956, he became the fourth Archbishop of the Archdiocese of Saint Paul following the death of Archbishop Murray. One year later, in response to the growing rural Catholic population, Archbishop Brady ordained Fr. Alphonse Schladweiler as the first bishop of the newly created Diocese of New Ulm. The Great Depression and World War II had delayed the finalization of the Cathedral of Saint Paul, thus the final interior furnishings were resumed and finished under Archbishop Brady. The Cathedral was formally consecrated on October 14, 1958. Archbishop Brady also revised the diocesan newspaper, and contributed a weekly column. His main concern was to challenge the Catholics of the Archdiocese to a more active living of the Gospel message, and his use of the newspaper as a tool of evangelization demonstrated his style of leadership with a vision to the future of the Catholic Church in America. Moreover, four Catholic high schools were built during his episcopate, and he also fostered the “Opus Sancti Petri” campaigns to recruit and support vocations to the priesthood. Right before the convening of the Second Vatican Council, Archbishop Brady unexpectedly died of a coronary in Rome on October 1st, 1961.